Recently Mr JibberJabber and I went back to where we first met at university. We found that many things had changed and yet amazingly other things seemed to have been frozen in time! When we left university we moved across the country and were lucky to secure jobs within two months. Now the jobs market has changed significantly from what's available to how you go about finding a job. The first full-time job I got was at a company I was sent to as a temp. They told me they were having a jobs open evening at which I got asked if I wanted a job and that was that! It wasn't in the industry I had planned on going in to but sometimes you have to divert your career path slightly. Soon final year students will be starting their last semester and the dreaded final exams. If you've taken a year out to work in industry or spent your summer holidays working then you may already have a job lined up for when you finish. For many people though for the first time there will be no more education, no more learning and no money coming in! 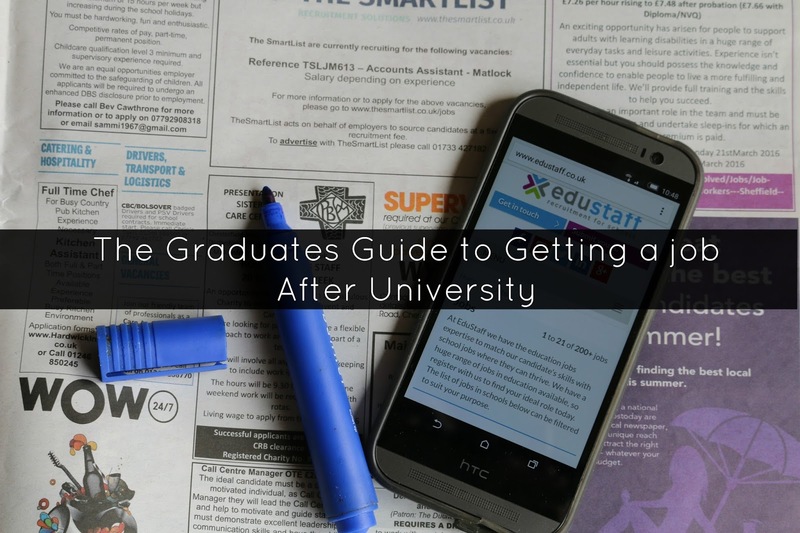 If you're worried about life after university either for yourself or someone you know have a read through today's guest post. “A recent survey conducted by NUS market research revealed that 40% of students thought it would be 'challenging' to find a job after graduating, while 8% believed it would be 'impossible'. While it is true that the job market is more competitive than ever, it is by no means an impossible task to land your dream job once you graduate. Here are just a few tips that could set you on the right track. just as important to employers as what you may or may not have on your CV. This kind of honest can only come if you have concentrated your search on areas that appeal to you early. For example, successful applicants for teaching jobs will have given considerable thought to what the profession has to offer and what they specifically can bring to the role. A clear objective and ambition is always helpful. Though an understanding of where you want your career to go is vital, successful candidates are, in most cases, those who are willing to try their hand at a variety of different things. Those applying for entry level positions in particular will find that employers will respond well to individuals that display flexibility and a willingness to learn and develop. Do not fall into the trap of thinking that your career is defined by your first job. A demonstration of adaptability and strong work ethic will impress your employers and, once you have acquired necessary experience, allow you to shape and tailor you career in a direction that suits you. A google search for 'marketing jobs' returns over 600 million results. The same is true for any number of professions that could interest potential graduates. Faced with such vast numbers, the application process can seem rather intimidating. The key is to not be put off by the wealth of opportunity, but to embrace it. Logic dictates that focused applications sent to a number of different companies are more likely to return a successful result than applications sent to just one or two. Therefore you must be as productive as you can when it comes to sending off as many applications as possible. Are you currently looking to change jobs? How did you get your first job? Mr brother is going back to university this year after graduating last september. He has actually managed to get a few jobs in the last few months to earn some spare money but is going back to learn more to help him get his dream job. Yes, definitely be positive and tenacious, it will get you what you want. It took my husband a few different jobs to finally work out what career path was best for him when he came out of university. Persistence is key. never give up! Be prepared for rejection. The job market is extremely tough but don't take it personally. I am responsible for recruitment in my current job and I'm terrified how many people show up for an interview in ripped jeans and hoodies! My favourite was one guy who came in with a T-shirt saying "f you". Brilliant first impression! It was a very long time ago that I was in this 'fresh graduate' situation, but even then it seemed daunting. Don't think it has got any easier! A really good guide with lots of tips. I never went to Uni, so am thankful I didn't have to struggle.